Would it be heretical to suggest that the early films of Yasujiro Ozu are richer than his canonical work? This isn’t to impugn the later films, of course: the mature Ozu is one of the unquestioned glories of the cinema. Yet perhaps it is that very maturity, the blissful culmination of a style shaped over three decades of filmmaking, which gives the later work a certain, if not rigidity, then a definite feeling of ritual. Like the contemporaneously late output of John Ford, from whom Ozu learned so much as a young director, there is an increasing nakedness in Ozu’s habitual themes, the concerns of an artistic lifetime comfortably rolled out in the hands of a semi-permanent stock company of actors, technicians, and collaborators. With that ease, however, comes a partial—but noticeable—lack of depth to the work, a parade of familiar tropes missing the emotional affect they once carried. Like Ford, Ozu was too strong an artist to give that decline any degree of consistency—his second-to-last film, The End of Summer (1961), has as disturbing and richly complex a conclusion as The Man Who Shot Liberty Valance (1962)—but the foursquare dialogue shots and the endless rounds of sake somewhat dampen the impact of such films as Late Autumn (1960) and An Autumn Afternoon (1962). No one would ever want to sacrifice the mastery evident in every one of Ozu’s late films, but one of the great contributions of the touring retrospective honoring the centenary of Ozu’s birth is the awareness it has fostered of Ozu’s early work: comedies, student films, wrenching family dramas, neorealist-like social documents, and crime (!) thrillers. Varying widely in tone and subject (and quality), these films remain important not merely as clues to the genius that would later come to full flower but as major accomplishments in their own right and speculations on paths not taken—or rather, the paths that Ozu quietly sheared from his work as he sought to purify it to its finest essence. For me, the most intriguing aspect of these films is Ozu’s remarkable facility with the moving camera. The young Ozu plows through his environments with an almost giddy sense of discovery: the camera prowls the streets of Tokyo fastened to automobile fenders, glides through artfully cramped tenement apartments, explores the strange industrial landscapes encroaching on the sylvan beauty of nature. 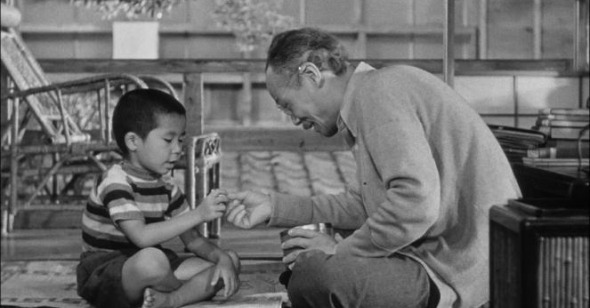 Though his films would become far more placid, Ozu was never to lose this innate dynamism. Watching as his style develops and the camera becomes fixed more firmly in place, it’s fascinating to witness how Ozu transfers that exuberant, flowing sense of motion to the interior of his art, the fluid stream running just beneath the surface of his films, which endows even the immovable architecture with the pulsing feeling of life. It’s this wondrous quality that I miss in some of the later Ozu, as I miss it in Dreyer’s Ordet (1955), everything by Kiarostami after Life and Nothing More (1990), and anything by Hou Hsiao-hsien, precision and assurance of style taking precedence over the living core of the work. For these artists, refinement of technique has the double-edged tendency to isolate them from the social and historical conditions of their work, removing it to a private, ethereal plane. Studying artists as in a vacuum is a particularly ineffective, and popular, critical method. For all the nuances of style which these fine-toothed combs turn up, the restless, shifting, breathing whole often escapes their grasp. And for an artist whose style is as instantly recognizable as Ozu’s, it is all too easy to merely catalogue the surface traces of composition and gesture rather than consider the living creative and historic continuum of which it is a part. This may seem like a rather disparate preface to Early Summer (1951), for it is definitively situated in Ozu’s late period, midway between the twin milestones of Late Spring (1949) and Tokyo Story (1953) and generally regarded as only a slight notch below them. Perhaps this is what makes it my own personal favorite of all Ozu’s films. With a larger canvas than the intensive focus of Late Spring and a looser structure than the exacting symmetry of Tokyo Story, Early Summer feels freer, wider, more open even as it evinces the full-fledged mastery of the mature Ozu. Chronicling three generations of the Mamiya clan, Early Summer revolves, of course, around marriage: the efforts of the family to marry off their eldest daughter, Noriko (the incomparable Setsuko Hara) to a promising match, and Noriko’s own quietly firm ideas about how and to whom she will give herself. While the question of Noriko’s marriage is the motivating force of the film, Ozu typically makes use of that force to set other points on his dramatic axis into motion. As David Bordwell notes in his essay accompanying the Criterion Collection’s beautiful edition of Early Summer, the film features 19 characters, plus a crucial 20th who is mentioned but never appears. The spectrum of thematic and emotional strains which Ozu gently coaxes from this ensemble yields some of his loveliest moments, many of them captured with that long-dormant moving camera. There are few scenes in cinema more beautiful or crushingly sad than the aging parents of the clan (Ichiro Sagai and Chieko Higashiyama) sitting on a park bench on a lovely summer day, contemplating Noriko’s approaching marriage and sensibly—not whole-heartedly—concluding that “this may be the happiest time of our lives”; spotting a balloon floating into the sky, the mother comments, “A child must be crying somewhere.” Running away from their officious father (Chishu Ryu) after being disciplined, the two grandchildren walk along the shore, where the older of the two sits down and yells out to the sea “Idiot! Idiot!” The Mamiyas’ neighbor Tami (Haruko Sugimura) collapses in tears of joy when Noriko unexpectedly agrees to marry her son. The patriarch sits down at a railway crossing as he waits for a train to pass, letting the weight of Noriko’s decision settle gently and helplessly upon him. Noriko runs happily, freely, down the beach, beckoning her reserved sister-in-law Fumiko (Kuniko Miyake) to follow. The emotional kinesis of these moments, and so many others, shows Ozu’s art at its peak, inexpressibles given form, measure, and coursing life. Of course, this majesty was only one side of Ozu. As Donald Richie pricelessly puts it in his commentary track, “We focus so much on the sublimities of Ozu that we forget how much farting goes on in the pictures.” Homely detail was just as much a part of Ozu, and it’s to Criterion’s credit that with Early Summer they have expanded the hagiographical tone of the supplemental material on the Tokyo Story disc to include wider considerations of the films and the environment from which they sprang. Richie is the chief source of this context, his smooth commentary helpfully expositing the social and economic underpinnings of the story as well as locating Ozu within the tradition of the Japanese studio system. Ozu’s studio, Shochiku, also contributes a video segment, Ozu’s Films from Behind the Scenes, featuring conversation and reminiscences from sound technician Kojiro Suematsu, assistant cameraman Takashi Kawamata, and producer Shizuo Yamanouchi. The very lack of penetration in these discussions feels perfectly appropriate. Ozu’s former collaborators focus on the nuts-and-bolts process of carrying out the director’s instructions, and they also reveal the skill with which he navigated studio demands while holding faith with his own unique vision. The tendency of the commentary and features is thus to demystify the beatified Ozu even as he is celebrated, to gain a greater perspective on the historical figure behind the films. It’s fitting that Criterion chose to follow up their invaluable double-disc edition of the silent A Story of Floating Weeds (1934) and its color remake, Floating Weeds (1959), with Early Summer, for in many ways the film bridges within itself the historical divide between the former two: a link to the past in the camera’s frequent and graceful movement and a look to the future with its theme of the family in dissolution; the fine lines of the master stylist falling into place while retaining the charmingly deceptive casualness of the natural humanist. Early Summer lies at the very heart of Ozu’s cinema, shows at their fullest the many divergent facets of his art given unity by that famously harmonious style. For all his warmth, Ozu was one of the true tragedians of the cinema. In this film about beginnings which so beautifully hearkens back to his own, Ozu’s eternal subject—and eternal tragedy—still comes to the fore: time, the source of all beginnings and of their inescapable dissolution. The very immortality of Ozu’s art only makes that tragedy the more painful, the more precious.